Everything Is Art: Book Review: "Colored Pencil Solution Book"
It's a brilliant book written by Janie Gildow and Barbara Benedetti Newton, covering subjects that are difficult to render in colored pencils. The next chapter covers composition. The chapter has a good amount of illustrations and examples to aid beginners in understanding how to identify what makes a good composition. Page 33 even has a small list to show how you can effectively judge a composition on whether it'll work or needs improvement. Pages 52-53 were interesting also. Showing how one can add interest to your work by using different strokes on your paper to provide excitement. The pages cover the vertical-line technique, juxtaposing colors, and the open crosshatch technique, which are all brilliant. The last three chapters are the chapters that are laden with demonstrations. All demonstrations have line drawings, which you, the reader can use, from the back of the book. All the demonstrations also clearly show what kind of surface the artist uses and what colors were used. The 5th chapter covers "reflection and transparency solutions", and talks about metals, glass, water, semi-transparent subjects, mirrors, and the elusive single drop of water. Chapter 6 offers solutions to render textures, such as fabrics, indian corn, the smooth waxy surface of peppers, and velvety roses. While the last chapter, "problem subjects and fixing mistakes" is very interesting for the little problems that can cause big headaches when we don't know how to fix them. "Learn that all is not lost when you make a mistake." as the authors write. From repairing dents and nicks in your paper, to lightening your colors. The authors even share what to do if you've stained your paper with coffee or raspberry juice. The chapter ends with a few more demonstrations on difficult subjects. The anatomy of lace is broken down for you. (They're very good at rendering lace.) There's a mini demonstration on how to draw a basket, how to make stripped fabric look believable, and how to draw fringe. All in all, I've learnt a couple of things from this book. Like, that layering in uneven patterns make for a far more interesting subject, how to draw on a black background, the complementary color wheel, (which I've never seen elsewhere before.) and the vertical line technique. 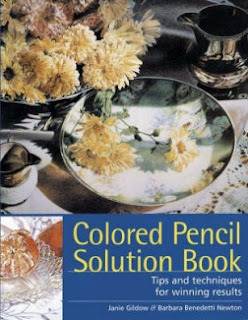 "Colored Pencil Solution Book" has a good coverage of the basics, and a beginner reading it will understand the materials needed, and the different ways colored pencil artists draw. For advanced artists, the book offers a few good techniques, and help on how to render subjects. (And I mean, how many book teach you how to remove coffee stains from your art work?) With an easy to follow layout and beautiful design, it's a good book to have in your shelf for reference.